The ISW-800T-M12 is a 8-Port 10/100Mbps M12 industrial fast Ethernet switch from Planet Technology that showcases a durable metal casing. The unit offers resistance to harsh industrial conditions and allows for efficient wall mounting and installation. 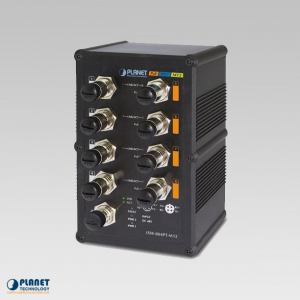 The ISW-800T-M12 features 8 ports that are 10/100Base-TX auto-negotiation ports with M12 connector interfaces. The M12 connectors offer efficient connectivity and provides quality Ethernet operation under tough conditions. Since the unit operates efficiently in temperature ranges from -40 to 75°C, the unit is ideal for use worldwide and can be placed in almost any location. The ISW-800T-M12 features an integrated power supply source that features a range of voltages from 12 to 48V DC for applications that require additional or backup power. 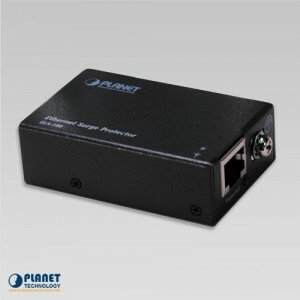 The ISW-800T-M12 features a 2K MAC Address table and wire-speed packets transfer that does not risk packet loss. The unit’s high data throughput makes it a great choice for locations with Fast Ethernet. 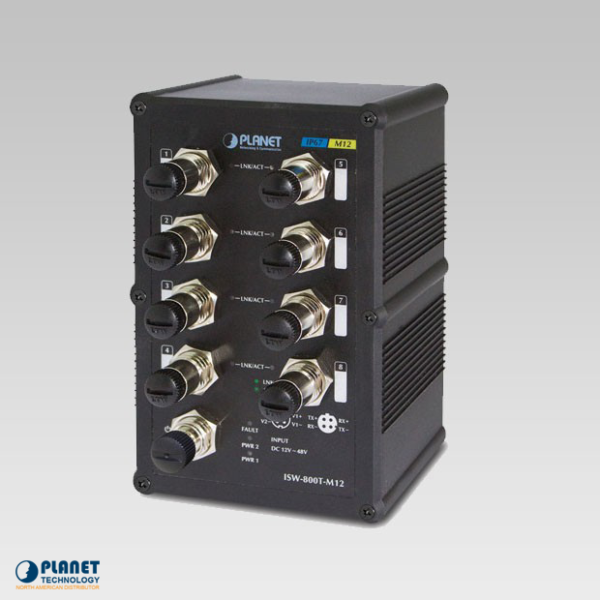 Since the ISW-800T-M12 features a 1.6Gbps internal switching fabric and auto negotiation support in each port, the unit has the ability to take on large data amounts. The unit’s flow control function allows for efficient and quick data transfer. The M12 RJ-45 copper interfaces support 10/100Mbps Auto-Negotiation to ensure speed detection that is efficient through RJ-45 Category 3, 4, 5, 5e, 6 cables. Auto-MDI/MDI-X support has the ability to determine connection type to Ethernet devices without additional cabling.